On trend in general design and fashion, we always see is that everything old is turning out to be new again. When it comes to graphic designing too, you may find 2018 as a year of modernized trends, diverging from the existing flat design landscapes. 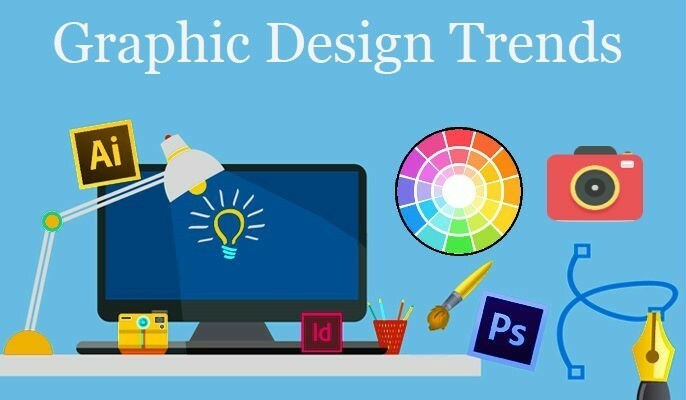 Simplification and minimalism will take the ground back, but you can expect to see some of the old favorites in graphic designing trends a grand return with a modern touch. If you want to be in vogue and add some of some contemporary flairs to your designs, here are five design trends which may wow the viewers in 2018. It has been close to a half a decade since responsive web design began to evolve and revolutionize the web, and now it has become the industry norm. The rapid increase in mobile users accessing the internet through smartphones and devices of varying screen sizes has made it mandatory for any website owner to make their sites responsive. New–age developers and designers have started to experiment with various methods to make their designs adapt to different screen devices with a one-site-fitting-all layout. Now, the trend in responsive is to altering the brand logos too to fit the need of responsiveness. Companies are refreshing their logos to more simplified and flexible versions over the last several years, and responsive logo design is the next logical need to meet the changing demands. Gradients are now found in the website buttons to page headers and even the footer. Not just a web page, but your corporate PDF is also not cool looking unless you let a gradient flaunt on the cover. It has also become a norm now in website design, and you can see how websites like Stripe uses the most vibrant gradient backgrounds over semi flat illustrations. As flat design concept is evolving, gradients are now making a modern-day comeback as an enhancement to the latest design strategies. This design update is coming as a part of what is often referred to as the “flat 2.0” design, alternatively known as “semi-flat” design. The gradient reappearance in the latest iOS version and also adoption by the industry giants like Instagram and Stripe made it popular all again, and you can see it in abundance in UI, backgrounds, branding, illustrations, and text overlays. Similar to gradients as discussed above, tayloright.com experts point to the fact that shadows are also officially coming back in the year 2018. As in case of gradients, shadows were also put on the background once we struck with skeuomorphism and realism in the past to favor optimum minimalism and 2D design concepts. However, it is coming back now with major adopts by the industry giants on the design features. In real, depth is a very valuable tactic which helps the users to determine the visual hierarchy of things like focusing on the calls to action. Graphic designers were experimenting a lot of with long-shadows to add an extra dimension to their otherwise flat design. Now, Google Material Design again introduced shadows as a critical enhancement to their user interface. This concept quickly spread, and many designers started reintroducing shadows in their own ways. However, these new shows were large and soft, sometimes even colored to add subtle depth and dimensions when compared to the drop-shadow type overused predecessors. Duotones were a standard practice crated with the use of halftone printing. In this, a halftone is printed on top of the other with a contrasting color to form a duotone image. This old-age technique has now gained a new life in the digital media. Unlike the olden day hard printing, modern imaging software has made it easier to create instant duotones and several variants of it as tritones, quadtones, or fake duotones as tinted images. You can see how Spotify marked their return by using duotone images for their app and promotional blogs. Designers are now mainly taking advantage of this technique as the innovative imagery created with it is far delightful on a semi-flat design. With the possibility of using many bold colors and elegant applications, duotones may remain as one of the best graphic design trends in 2018 and beyond. Typography is another design sector which always kept on evolving. When it comes to the use of typography in graphic design in 2018, based on the evolving trends, we have to expect that it will get bigger and better. Designers may opt for more artistic effects to be incorporated into typography, extra large fonts and huge headlines may become popular. We can see recently that Helvetica-inspired Sans Serifs are dominating the digital space now, and even when it remains one of the most fashionable ones, we can expect more familiar typefaces in the forthcoming years. There is no doubt that it is an exciting time for graphics designing. Graphic art is getting revitalized, and we have started to see the solid resistance to the flat design movement. In every possibility, we can expect the design sector to get more and more exciting and unconventional by the second half of this year and continue to focus more on individuality and originality. Maria Jones is a digital art fellow and multidisciplinary artist who is into design and development for the last ten years. She now specializes in the responsive design and used to write blogs and tayloright.com about evolving graphics and web design concepts. its a nice & attractive post… keep it up. This is some really good information about the graphic design. It is good to know that it would be smart to make sure that your logo design will fit on a bunch of different types of screens. That is a good thing for you to know if you need to get a logo designed and want to use it on a lot of different sites. Now that year is coming to an end, I can say that I’ve seen a lot of mentioned graphic design trends during this year. Besides the ones that are mentioned in the article I would like to add the elements inspired by 90s design, animation and isometric design which is really popular with tech firms. Very good article for the graphic design trends. Thank you so much. Really very nice post thanks for share …..keep it up………. Really really good information for me. Graphic design in my hobby. The best article in graphic design. This is very useful for us. Thank you for sharing this information. Very good article. It’s helpful for us to post it. Thank you so much for sharing such tents.